Depauville, NY (March 21, 2019) – A 21-year-old man was reported to have tragically lost his life when the farm tractor he had been riding in rolled over on Wednesday morning, March 20th. The fatal accident was stated to have taken place along Route 12, near Old Town Springs Road, around 11:00 a.m., according to authorities. Emergency responders arrived at the scene where they found Steven A. Scott II, 21, of Clayton, pinned between a component in the cab of the tractor and the road. Crews worked to remove Scott from the vehicle, as he had to be pulled through the back window. Medical crews ultimately determined that the victim could not be resuscitated at the scene, where he was sadly pronounced deceased. Additionally, authorities found that Scott had been traveling with another party, identified as Nathan S. Kilborn, 21, of Clayton, who suffered injuries in the crash. Kilborn was immediately taken to Samaritan Medical Center to be treated for injuries that have not been specified. 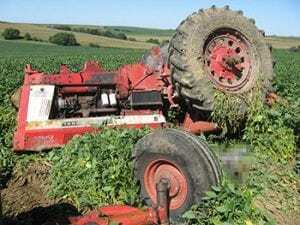 At this time, it appears that the operator lost control of the tractor, however, the cause of the crash is under investigation. Unfortunately, New York work-related injuries, truck accidents, and many other serious mishaps occur nearly every day and tragically result in the loss of life and critical injuries. Before moving on, we would like to extend our deepest condolences to the loved ones of Steven A. Scott II during this devastating time. We also offer our most genuine sympathies to Nathan S. Kilborn as we maintain hope for his full recovery. At Hach & Rose, we understand that there is nothing as overwhelming as the sudden loss of a loved one, and we have made it our mission to hold negligent parties and other entities liable for the pain and destruction they cause. Our compassionate accident attorneys are here for you 24/7 to answer any questions you may have regarding the loss of a family member or an injury which occurred for reasons beyond the victims’ control. If you have lost a loved one or suffered injuries in a personal injury accident in New York, please do not hesitate to call us at 212-779-0057 today.